A hunter has been fatally shot by his own dog in a freak accident in Russia. The 64-year-old man, who local media identified as Sergei Terekhov, had gone hunting with his brother in a remote area in the Saratov region near the Volga river, according to the regional investigative committee. The tragic turn of events occurred when Mr Terekhov went to let two Estonian hounds out of his Lada car. Quoting an investigator, local news site Region 64 reported that Mr Terekhov's double-barrelled shotgun had been resting against his knee and was pointing toward him. As his brother looked on, one of the dogs jumped toward Mr Terekhov and hit the trigger with its paw, discharging the gun into the hunter's abdomen. His brother drove him to the hospital, but he died of his wounds on the way. Photographs from Mr Terekhov's page on the Odnoklassniki social network showed he was an avid sportsman who loved hunting rabbits. 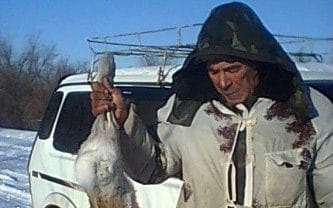 In one of them, he posed next to two rabbit carcasses with a shotgun and a dog.